New edition Video Adapter goes on sale with ORCA and DOLPHIN laptops from CompAmerica. Extreme Graphics performance with 512MB of memory, leads the pack, blows the doors off all competitors when benchmarked. we intend to keep ahead of the Joneses. We are also the first manufacturer to offer an optional Platinum Protection Shipping Warranty designed to protect users against shipping and handling issues and hazards worldwide, guaranteeing fast ship, fast delivery and rapid recovery from problems. 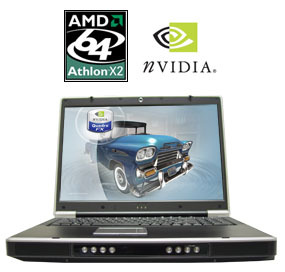 CompAmerica released, ahead of most other manufacturers, the nVidia 7950GTX "Hyper GPU", available immediately for two of its laptops: the AMD FX-60/X2 Athlon Dual Core based ORCA FX-2/7950, and the INTEL Core 2 Duo Centrino Duo based DOLPHIN 5724/7950. The company indicated that it will extend all current 7900GTX based offerings in current laptop and desktop models with the 7950GTX and its desktop dual equivalent, "within two weeks". CompAmerica is the first computer manufacturer to supply the 7950GTX, with samples in the field during September. "The extremely advanced 7950GTX extends the performance range for gamers and multimedia users and developers while coming in at an incremental price of $99," stated returning company CEO Dr. Jack A. Shulman. "The newer Extreme HD capability of the 7950 leads to extreme high definition using an extended edition of the 7900 GeForce Go Engine. It literally blasts through today's graphic intensive games with advanced 3D effects at extreme HD resolution. After a day of gaming, kick back and watch HD Videos on your notebook featuring nVidia's advanced PureVideo technology: high definition video playback and superb picture clarity, without compromising frame rates or color performance. The new 7950 GTX achieves between 10 and 30% greater performance over the 7900, at a very low price tag, providing two very neat options about $100 apart." CompAmerica's ORCA, Dolphin and Starbook series will all support Go 7950GTX technology, said a company spokesperson. The entire CompAmerica mobile product line can be found at Mobilstar. "We lead the laptop industry with the finest products possible, superior to the largest competition out there," added Shulman, "we intend to keep ahead of the Joneses. We are also the first manufacturer to offer an optional Platinum Protection Shipping Warranty designed to protect users against shipping and handling issues and hazards worldwide, guaranteeing fast ship, fast delivery and rapid recovery from problems." CompAmerica is an advanced 30 year old multidivisional computer company headquartered in the USA with business units around the world. The company's main website CompAmerica serves as an anchor for the group's growing business in mobile, portable, desktop and server products. For more information, please contact the company. LINER NOTE: CompAmerica indicated that the new products are relevant to users of Microsoft Windows, gamers, gaming, video, cadcam, and other user areas. Relevant technology included Centrino Duo, Pentium, 7900, 7800, and other nvidia technology, film, movie and TV developers and other relevant subjects.